One in awhile while on a road trip, we run across real news. 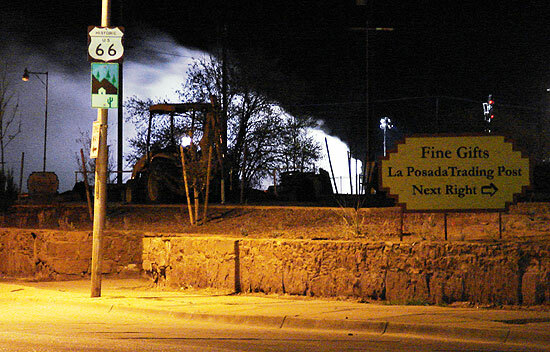 On the 21st of last month (March, 2007) we were driving eastbound through Winslow, AZ, on route 66 when we noticed emergency vehicles blocking Rt66 and a plume of smoke just beyond La Posada, the restored Harvey House at which we usually take dinner while in Winslow. The smoke was coming from a burning wooden railroad bridge under the busy BNSF main line; railroad traffic to and from the busy port of Long Beach, CA, was affected for hours. Winslow police apprehended at least one young boy related to the incident; you can read about it in the Winslow News. 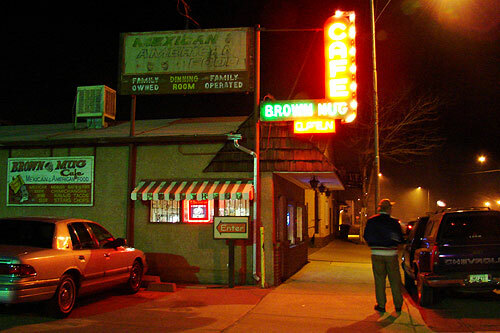 You can see smoke in the street lights outside the Brown Mug Cafe, across from La Posada. It was time to eat something, and we'd never tried this place, so, in we went. 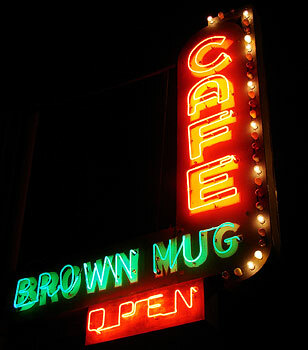 We'd been curious about the Brown Mug before, and I'm a sucker for a place with a well-maintained neon sign. Actually, the sign was unlit on its east side, but as Route 66 is a pair of one-way streets through Winslow and the sign was lit on the sign you'd see approaching it, I don't suppose it matters. It was a nice little cafe, with an apparent cast of regulars. 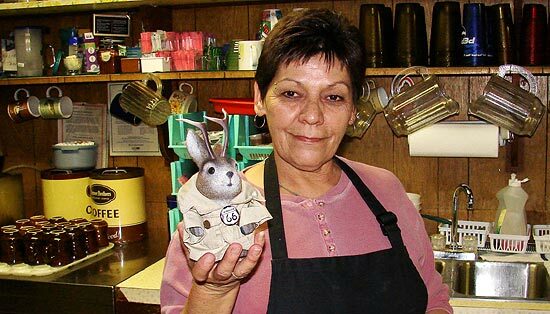 Occasionally, the air in the cafe smelled strongly of burning creosote from the bridge fire, but customers seemed to take this in stride. Our hostess thought Ace was cute and wanted to know more about him. I don't have the knack for photographing food attractively, especially on the spot, but this was good stuff. 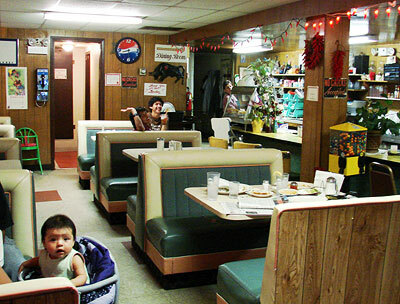 The menu was mostly Mexican, with some mainstream American thrown in. I'm actually not a fan of Mexican food while at home in the Midwest, but it seems so much better prepared in the Southwest that I sample it often while there. 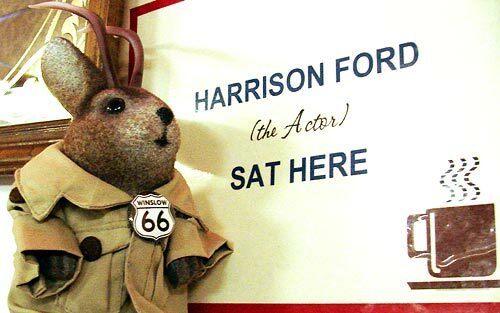 Ace donned his Blade Runner, coat to check out the booth where Harrison Ford once sat. 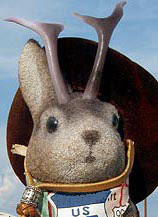 That's Harrison Ford the actor, you know.